The Wellcome Library is founded on the collection of Sir Henry Wellcome (1853 – 1936) whose main interest was the history of medicine, and included subjects such as alchemy, witchcraft, anthropoplogy and ethnography. The Medical Collection comprises thousands of medical monographs, anatomical Atlas More Detailses, pharmacopoeias and some 20,000 items of medical ephemera, as well as a growing number of electronic resources covering a diverse range of subjects including popular science, consumer health, biomedical science policy, research ethics, science education and public engagement with science. It is one of the world's major resources for the study of medical history. Among the medieval manuscripts held by the Wellcome Library, some, such as MS. 49, have survived through time thanks to their status as beautiful objects. Others are less impressive at first sight. MS. 335, a miscellany of medical and religious texts, is one of these: it might go unnoticed, due to its narrow format and its simple and worn binding, but a few minutes spent examining it are enough to realise that it is a fascinating work. Dating from about 1490, MS. 335 is probably of French origin. Its vellum binding is original. The writing is small and cursive, with many abbreviations. As to the content, it is very heterogeneous: medical recipes and scientific works cohabit with religious texts such as those one might find in a Book of Hours. Among these varied texts the longest and probably most interesting is a herbal in Latin, which describes no less than 143 plants, including 116 that are beautifully illustrated, like the plantain in the image above. 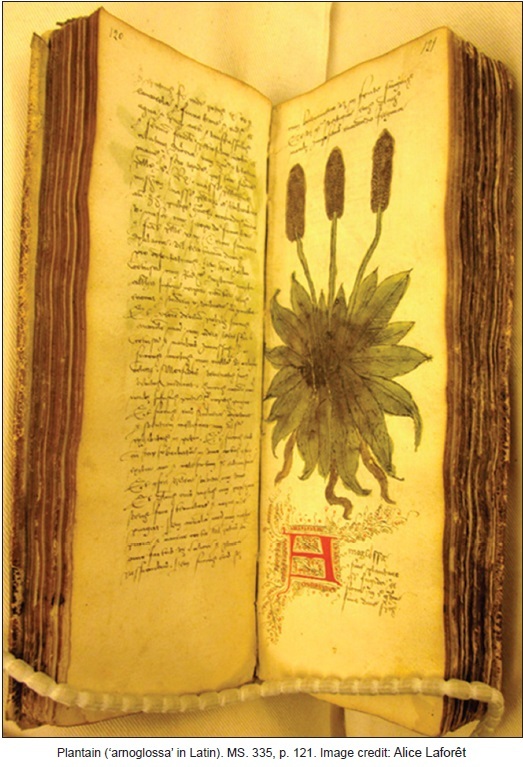 But before exploring in more detail the wonders and mysteries of the herbal, let's take a quick look at the other texts that are part of this manuscript. The manuscript starts with three pages of medical considerations on urine, followed by miscellaneous texts on plague. These are particularly interesting, for they come from quite different sources, some of the texts being in French, while others are written in Latin. Three of them describe the plague and its symptoms (fever, and buboes growing on different parts of the body), while the others teach methods of combating the plague, giving for example the recipe of a red powder deemed to be very effective to this end. The texts on plague are followed without any transition by a list of prayers, to the Virgin Mary, Saint Peter, Saint Benedict and many martyr-saints, together with the liturgies for different Christian celebrations (Easter, Epiphany and so on). The rest of the manuscript follows the same scheme, alternating various medical recipes with religious texts. It is also noteworthy that two of the volume's texts are short excerpts, about body parts, from two of the most famous medieval encyclopedias, the 'Etymologiae' of Isidore of Seville and the 'De proprietatibus rerum' of Bartholomaeus Anglicus. It is more than likely that all these texts were copied together at the same time, rather than being bound together at a later date. The scribal hand seems indeed to be the same for all the texts, and the end of a religious text on the recto of a leaf is often followed by a medical text on the verso. This specific compilation of texts was probably put together by its owner. Far from being a luxury item, this manuscript is rather a handbook, meant to be used and transported, in order to provide information to serve its owner's needs and interests. The small cursive writing, the presence of a few very simple pen drawings in the margins, as well as the narrow format (21.5 × 7.5 cm), are signs of this manuscript being almost a 'pocket-book'. MS. 335 reflects the quotidian life of a learned man of the 15th century, who was involved with theoretical and perhaps also practical medicine, the herbal being an essential source of information on the plants that were the main ingredients of most medical recipes. As for the numerous prayers, they are meant to remind the owner of his Christian duties, but we can also read them as a way of providing protection against epidemics and other kinds of illness, since, in medieval thinking, medicine alone without divine intercession was not sufficient to combat diseases. Let's now go back to the herbal, which remains the most fascinating text in this manuscript. Among the many illustrations, we find remarkable representations of ivy, lettuce, leek, strawberry, and many other plants. 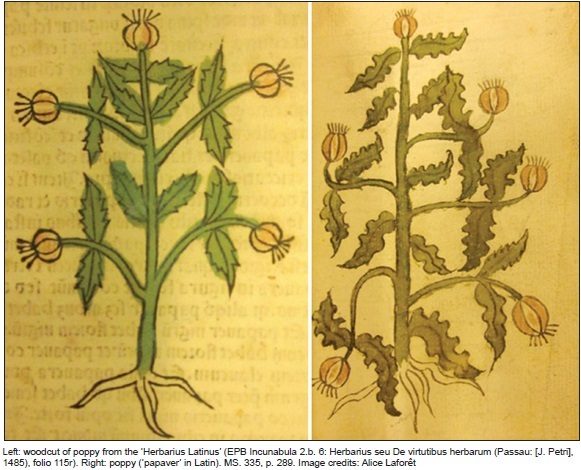 It appears that the text as well as the illustrations were copied from a printed book, the 'Herbarius Latinus', first published in 1484 by Peter Schoeffer, Gutenberg's associate. This printed herbal was a huge success: no less than 11 editions are known between 1484 and 1497, including the 1485 edition held by the Wellcome Library. The 'Herbarius' was thus a popular book in the earliest decades of printing. The probable date of our manuscript (c. 1490) is a little later than The first edition of the 'Herbarius': it is therefore likely that this manuscript was copied from one of the editions of the printed book (but it is difficult to determine which edition was the model, especially as the text in the manuscript seems to be incomplete). This proves the popularity of the 'Herbarius Latinus', but also demonstrates that there was no clear-cut divide between the era of handwritten books and that of printed books. Manuscripts still offered advantages compared to printed books. Hand-drawn illustrations were less rigid than woodcuts, and maybe more lifelike, as we can see by comparing the two images of the poppy below. This complex manuscript is therefore a real treasure, full of information on the transmission of medical knowledge in the Middle Ages. It was probably still used during the 16th century, for it has manuscript inscriptions by a later hand, and it continues to amaze us today. Agnes Arber, Herbals: their origin and evolution. A chapter in the history of botany, 1470–1670 (3rd edn. Cambridge: Cambridge University Press, 1986). 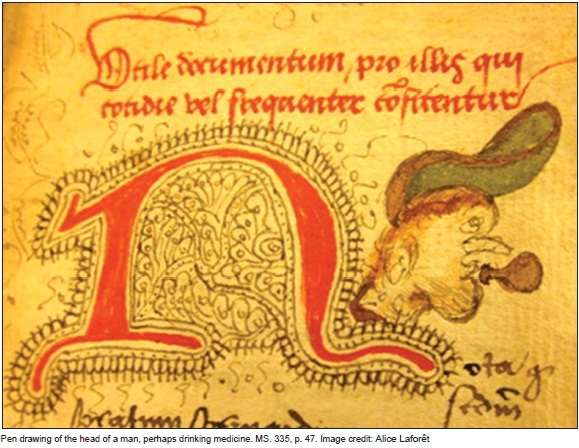 Minta Collins, Medieval herbals: the illustrative traditions (London: British Library, 2000).